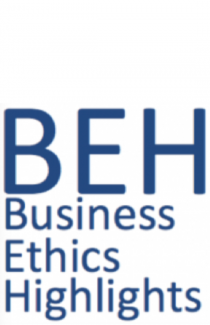 Abstract: In this interview based article, a panel of business ethicists explores the relationship between behavioral and normative approach to business ethics. Spurred by the meteoric rise of behavioral ethics over the last decade, the interview probes whether normative and behavioral ethics can and should be integrated as a matter of pedagogy. While the panelists diverge in the extent to which they emphasize normative or behavioral ethics in their teaching, a consensus emerges around the proposition that a business ethics course must tackle the integration of normative and behavioral approaches. In the course of the interview, a variety of strategies for doing so are introduced, and we conclude with two different conceptions for synthesizing the approaches, each proposed to make these insights accessible to instructors, whether trained in social science, philosophy or law. The “map and car” conception relies upon normative ethics to define one’s desired path and behavioral ethics to address the means for getting there given what we are like as humans, whereas the “spaghetti” model—drawing precedent from virtue ethics—conceives as intertwined the numerous threads of normative and behavioral ethics. Concrete teaching concepts for experimenting with these ideas are presented.